Ordered this perfume because I was researching the best smelling perfumes for women. I am not disappointed. Smells fantastic and lasts through the day! Reveal your dark, mysterious side when you put on the intriguing scent of Black Opium by Yves Saint Laurent. Launched in 2014, this women's eau de parfum surprises you with rich notes of coffee, patchouli, and cedar that mingle with softer hints of jasmine and vanilla. The three ounce bottle sparkles with sequin accents that create a look matching the bold scent of this women's eau de parfum. Dimensions 2.1 - 3 Oz. This is a beautiful scent and I've gotten several compliments while wearing it. I was a little worried that I'd receive a bottle from an older batch but the exact opposite happened. I always check the batch number of perfumes purchased online and was pleased to learn that my bottle had a production date of early 2016. I also purchased several other bottles and they all had production dates of 2016. Overall, I'm very pleased with my purchase and will continue adding to my collection using Overstock! Let me start by saying I first smelled this fragrance in Macy’s and I loved it so much, but the price was a little high for my taste. I was very skeptical about ordering it on overstock because of the mix reviews about them possibly selling fake perfume, BUT no this website is the real deal and you cannot beat the price at all! The packaging was sealed perfect, fragrance was exactly the same as in Macy’s, and when I searched the batch number on the bottom of my YSL box, it came up on google and said “Date of Manufacture was April 2017” so the shelf life is good for over the next two years! Don’t be scared to purchase. I’m so glad I decided to do it. Iam very picky and I always do full research before purchasing anything lol. Thank you so much Overstock for your authenticity and as always the super fast shipping!! This is my daughters most favorite Eau de Parfum spray. It makes a great birthday or special occasion gift. The decorative bottle looks great on a vanity too. I discovered this perfume in a magazine and had to have it! The YSL Eau de Parfum Spray smell is AMAZING and can be worn all day. I literally put it on in the morning and went to dinner the evening and the fragrance was still there. Really WORTH the buy! 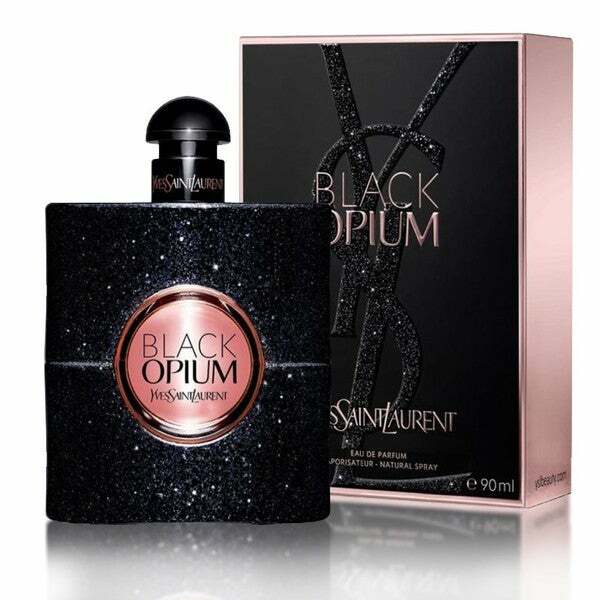 Black Opium by Yves Saint Laurent is wonderful. The scent is alluring and sensuous and lingers on the body all day and evening. A tiny spray goes a very long way. Wonderful!!!! And so many compliments received!!!! Love the fragrance! I bought for my wife as she likes perfume with woody notes. The Black opium dries down to a lovely floral vanilla combo. The fragrance lasts all day. I love the sparkle on the bottle, but as you know that is part of the wonder of perfume bottles. I like this perfume a lot. I was hoping for more patchouli and less vanilla but vanilla is most prominent. One description I read about the perfume mentioned patchouli and another did not. I'm a child of the sixties and still haven't outgrown my love of patchouli, so was a little disappointed I don't smell even a wisp of it in this. But I'm still happy I bought it. It lasts several hours on me (my clothes) and I believe it to be authentic. Excellent price on Overstock. This is my favorite perfume along with Poison. This fragrance is fruity but it also has a touch of amber which I love. The price on Overstock was quite reasonable based upon my research. I got this lovely smelling perfume for $43 dollars less than what it is sold for in store. This is my favorite perfume and it arrived seal with no damage to the box. Probably my most favorite parfumerie I ever bought! The bottle is beautiful too. My boyfriend loves the way it smells and it arrived earlier that expedited!!! This is my favorite scent of all time. I was thrilled to find it on overstock because it is $ in store and that is just too much! I get a ton of compliments every time I wear it! Everywhere I go I am complimented on how nice this perfume is. Never know when you shop online whether you will get fresh or older perfume. This was fresh and much cheaper than department stores. It came right away. Very pleased. This is a very subtle fragrance, very soft. Not at all like the stronger spicier scent of original opium. Wife loves it. Smells awesome. Last a long time. The projection is great. Gets alot of compliments. I would recommend this colgne to everyone. I absolutely love YSL’s Black Opium but am not so in love with the price, which goes for most of the perfumes I happen to like. So finding it available on Overstock was awesome in and of itself, but finding it at the lowest cost I’ve seen makes it the perfect cherry on top! Hopefully they keep selling it at this price. This is a really nice perfume. It’s bold but not overpowering. I had received a sample in the mail, and liked it enough to look it up on Overstock. A gift but exactly as it should be, she loved it. "does the opium black smell same as original opium and Is that spray on "
No it doesn't smell like the original, it's much lighter and yes it is a spray, Every time I wear opium black, I am getting compliments. No ,it smells very floral and sweet, nothing like the original. Yes it is a spray:) Hope this helps! FOR WIFE SAID BIRTHDAY, XMAS, AND THAT MAKES ME HAPPY!!!! !